Water quality in the Chesapeake Bay needs to be improved. To be sustainable for the future, the people of this region need to figure out how to live, work, farm and recreate in ways that allow the Chesapeake estuary to function and thrive. Contrary to the opinions of some, maintaining well-managed farms and private forests is an essential part of the solution. Essential, rather than optional, because farm soils improve water quality through filtration; because farmers can achieving pollution reductions more cheaply than sewage treatment plants or urban residents; and because agriculture does all this while contributing more to the region’s economy than any other single sector. The forthcoming Bay-wide TMDL will require deep reductions in nutrients and sediment, and present significant changes to farmers and every other Bay resident and business. 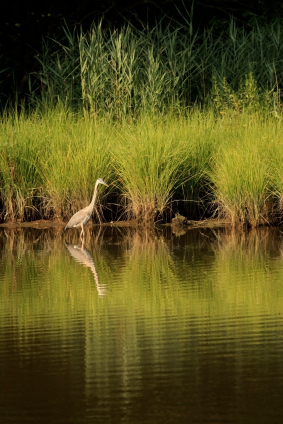 Bi-partisan legislation in the both House and the Senate has come through an often contentious and heated debate, with important policy and program tools help all of us to clean up the Chesapeake Bay. The Chesapeake Bay Program Reauthorization & Improvement Act was introduced in the House by Congressmen Holden (D-PA) and Goodlatte (R-VA), and passed out of the Agriculture Committee on unanimous voice vote. Rep. Holden worked hard to craft legislation that is responsive to the concerns of the agriculture community, recognizes their positive contributions, and helps set reasonable environmental goals for agriculture. The second bill, The Chesapeake Clean Water & Ecosystem Restoration Act of 2009, authored by Senator Cardin (D-MD), was revised with support from Senator Inhofe (R-OK), which enabled it to pass out of committee, also unanimously. Offer regulatory protection, a “safe harbor,” to farmers who are on track in implementing a conservation plan. Reinvigorate the potential for environmental-trading markets (the Senate bill with guarantees for investors, and the House with an impartial oversight commission). Mandate a complete, full and accurate accounting of all practices farmers have implemented up to the present, and moving forward. Provide funds to implement conservation practices, technical assistance, and research on farms. The Senate bill provides 20 percent of all state implementation grant resources for that purpose, and investments in research. Mandate greater collaboration between the EPA and USDA. The House bill increases the USDA’s authority in setting technical standards and developing a nutrient-trading program. When both parties and houses of Congress converge like this, it’s a sign of a real opportunity. At American Farmland Trust (AFT), we like what we see in these bills. Together they achieve a healthy balance of voluntary, incentive-based programs within an overall regulatory framework. Farmers need clearly defined expectations and requirements coupled with the flexibility to adapt practices to fit their individual farm operations. Regulatory-only approaches cost the public and farmers more. These bills offer an approach of shared responsibility and accountability. Farmers have done a lot to improve water quality, more than they are often given credit for, and more than other sectors. Nevertheless, all parties must be responsible and held accountable to take action and make improvements. Farmers and environmentalists deserve a final bill that’s equitable, balancing clear environmental standards with tools that will get the job done. If like Congress, farmers and environmentalists can keep their common goals in mind, and come together in a bi-partisan way, this legislation provides the tools we need to have healthy farms and a healthier Bay. About the Author: Jim Baird is Mid-Atlantic Director for the American Farmland Trust. This post was originally run in the Del Marva Farmer. This entry was posted in Agriculture and Environment, Chesapeake Bay, States, Water Quality and tagged Chesapeake Bay, Chesapeake Bay Program Reauthorization & Improvement Act, farmers, soil, The Chesapeake Clean Water & Ecosystem Restoration Act of 2009, TMDLs, Total Maximum Daily Loads on August 16, 2010 by admin. Alien-looking contraptions with metal arms protrude out of farm fields throughout the state of Washington. Look closer and you’ll see gauges on the arms measuring all kinds of weather data, from temperature and precipitation to wind, dew point, solar radiation and humidity. 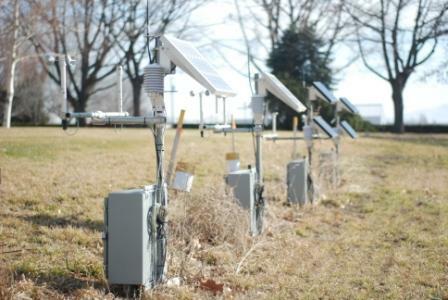 The stations—part of Washington’s AgWeatherNet—relay data to a website (weather.wsu.edu) that farmers and the public can check for free information on current weather and agricultural conditions. “I don’t know a farmer or field consultant who doesn’t use it,” says Washington State University (WSU) plant pathologist and AgWeatherNet director Gary Grove. “Over an eight year period, we went from a few people using it to everyone.” The network—launched in part by a grant from the EPA and American Farmland Trust—is one of the most advanced of its kind in the country. Farmers use it to make decisions about everything from irrigation and pruning to fertilizer and pesticide use. (And can sign up for text messages alerting them to adverse weather conditions). Grove and other WSU researchers are using the weather data—along with disease and insect models—to help growers predict potential insect and disease outbreaks. By better assessing the risk from such threats, the network is helping farmers reduce their chemical use. Grape growers, for instance, have been able to use the data to better time their efforts to combat powdery mildew that infects grapevines. “We’ve reduced fungicide use over 27 percent with wine grapes,” Grove says. This profile, along with many others can be found in the Integrated Pest Management cover story of our 2010 summer issue of American Farmland magazine. You can get your yearlong subscription by becoming a member of American Farmland Trust today. This entry was posted in Agriculture and Environment, States, Washington, Water Quality and tagged AgWeatherNet, American Farmland Trust, EPA, farmers, Fungicide, Pesticide, Washington State University on August 10, 2010 by Kirsten Ferguson.